I want to reflect on a word I introduced to (you) this advent as we prepared for Christmas. It is the word yearning. Yearning is not a word often used these days. It’s probably a word like trivial… Anyone under 20 would have no idea what it means. Yearning is about an intense longing or eagerness for something. There is at Christmas plenty of what I would call Lite yearning…. Wanting or wishing are not yearnings. Christmas is full of wishing and wanting but most of it is about trivial stuff made in China. I think God is found in our yearning. True yearning comes from deep within, from our soul. If you are in touch with your yearning you’ll be in touch with why God breathed life into you. People often talk of Jesus as a great moral teacher. I think he was, and I think we need to heed his moral teaching, but one of the profound truths he brought in to the world was a valuing of our humanity. As Christians we claim God was in Jesus yet the stories of his birth make it clear he was very human. A baby born in a poor house and put in some hay for a bed. It’s raw living. It says it is deep within our humanity that God is found. We often picture God, if we picture god at all as something or someone out there somewhere, but what if God is deep within us as human beings. I think Jesus affirms that idea. Our humanity is not alien to God but is somehow soaked in god like the trifle you may eat at lunchtime is soaked in sherry. I think in each of us there is a calling, a yearning,, a way of being, a gift that we bring into the world. I sometimes call it a soul dream. It’s usually apparent even as a youngster, but often we only see that much later in our lives as we get more in touch with this yearning. I think God is found in our yearning. True yearning comes from deep within, from our soul. If you are in touch with your yearning you’ll be in touch with why God breathed life into you. So I have an invitation to you this Christmas as you unwarp gifts…. Take time to unwrap the gift of yourself over the next few weeks. Take time to be more aware of your yearning. Jesus calls us to be more authentic, more us. We are as human beings God breathed but we need more silence and stillness to discover that… more conversations with others about our deep yearning. We need to look for the deep yearning in our children and see if we can’t nurture that. Beware though, if you start digging within it will bring you close to God and that could be scary and it certainly will be risky and challenging. It will also be fulfilling. I think we’ve had enough of saying our lives are about making money, endless activity and busyness…having freedom to do what we want…. We need authenticity and listening for the God voice of yearning deep within. And a final word….our yearning is often not clearly defined. It’s not usually reduced to a simple statement, but the best we manage is often to say’ “it has something to do with…..” “Something to do with”, is a good place to start. May God bless your yearning. NOTICES: A very warm welcome to all who worship with us today. Please join us for morning tea. Many thanks to Rev Alan Webster for leading our service. CWS Christmas Appeal: bring envelopes back to church any Sunday until January 20th. Wednesday Walkers: Informal walks will leave from South Library on 9th & 23rd January at 9.30am. On 16th January: Meet 9.30am at Bus Exchange for walk to Otakaro Orchard and talk by Peter Wells, Permiculture Designer. Contact Sue Saunders 960 7657. The Parish Office closes on Friday 21st December and will re-open on Wednesday 16th January. Elder Care resumes on Tuesday 15th January 10am – 2.30pm at Sydenham Community Centre. Building Work completed this week at the church….Ceiling insulation has been placed and installation of ceiling tiles completed in the church. The heaters have new seismic restraints installed. Carpet tiles have been delayed till the new year. The sliding doors are sliding.The final plumbing fit out has been completed. Kerbing at the front of the section has been installed. The structural engineer has been on site and has confirmed he will supply a PS4 statement saying the structural work is complete and the building has been brought up to 67% NBS. Post Christmas there will be a small amount of work to be completed in the upstairs store and the chip sealing of the car park will be completed. Inside carpet tiles will be laid on 15th January. With the Christmas shut down of 3 weeks it will be the end of January before Simon’s complete their work. 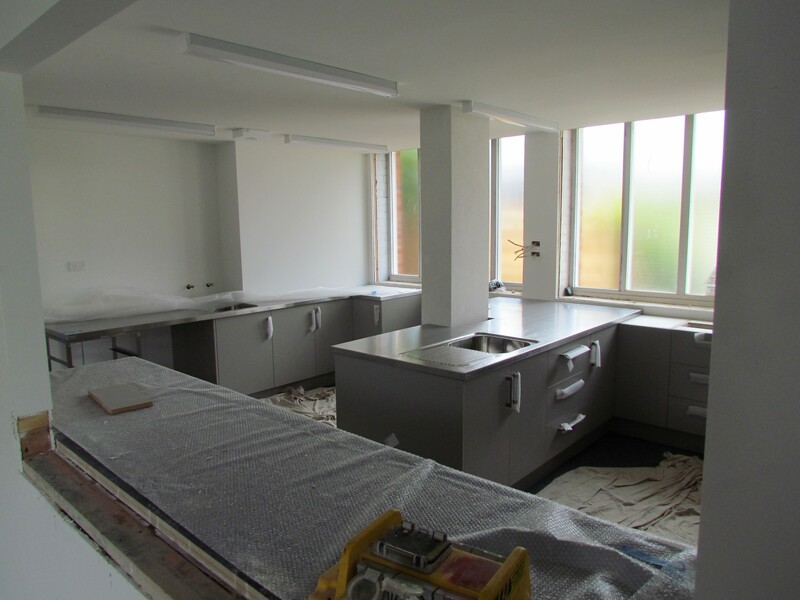 Practical completion will therefore be early February and then we will apply for a Code of Compliance Certificate. We expect to be able to use the building sometime in March 2019. There will be considerable amounts of work then required in the grounds including landscaping and the laying of concrete paths. Costs of our Church Repair: We have received the latest update of costs and it isn’t good news. We contracted with Simon Construction to undertake the repairs and strengthening with a price of $830,000 (GST incl). The latest update of costs shows we have nearly 60 variations to the contract and costs for these are $235,000. Approximately half of the costs are attributable to extra work required to install the steel reinforcing. Rewiring the building has cost approx. $40,000, new stacker doors $12,000 and extra fire requirements $8,500. In the last few days we have been faced with extra costs of replacement damaged ceiling tiles $4,000, extra connection to street storm water $5,000, seismic bracing to be installed for heaters $5,000. These are not luxury add ons, but essential work that will have to be done to get a Certificate of Compliance. We believe we have approx. 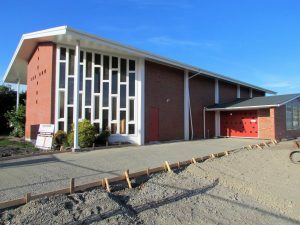 $260,000 left to complete payment for the repair work on the building. Funds currently available amount to $210,000. This includes a GST return due in January of approx. $90,000. That still leaves a shortfall of approx $50,000. We are working to ways we may address this situation, including beginning a ‘Give a Little’ page on the internet. Suggestions of ways we might raise this shortfall are gratefully received. The Building Team & Board of Managers. NOTICES: A very warm welcome to all who worship with us today. Please join us for morning tea after the service. Minister has led you astray…. some members of the Session have raised concerns about using the church without full sign off from the City Council. I doubt this will happen before February with the big Christmas shutdown and therefore I need to withdraw my promise to lead services in the church for Christmas. I also advertised an opening service on 27th January. This will not be the case. 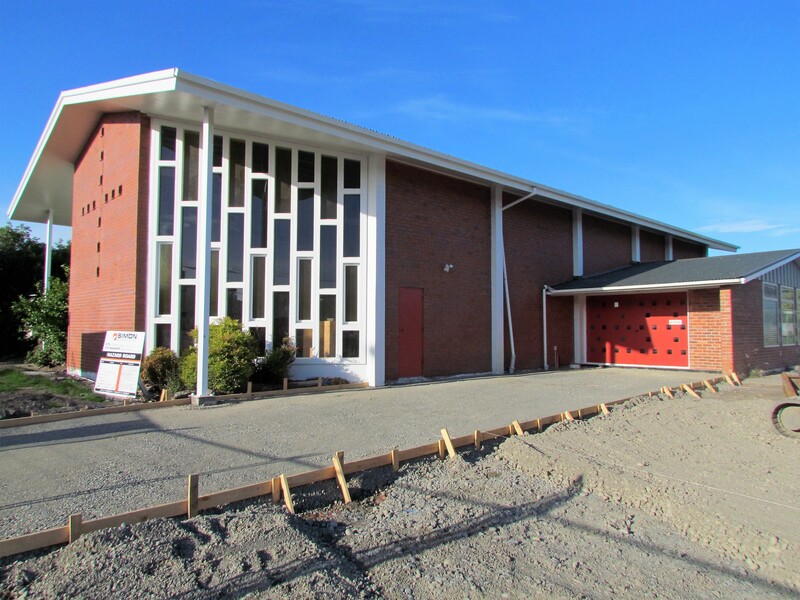 We need to expect that an opening service will be in March at a date yet to be determined. Carol Singing at Opawa Community Church, cnr Opawa Rd & Aynsley Tce TODAY 5pm with Stedfast Brass. BYO seat/rug. Light refreshments available to purchase. Wednesday Walkers: Informal walks will leave from South Library 19th December, 9th & 23rd January at 9.30am. On 16th January: Meet 9.30am at Bus Exchange for walk to Otakaro Orchard and talk by Peter Wells, Permiculture Designer. Contact Sue Saunders 960 7657. Good News Story…. The old lights from the church have been donated to an electrician from Papanui Baptist who will utilize them in one of the charitable projects he is working on. Costs of our Church Repair: We have received the latest update of costs and it isn’t good news. We contracted with Simon Construction to undertake the repairs and strengthening with a price of $830,000 (GST incl). The latest update of costs shows we have nearly 60 variations to the contract and costs for these are $230,000. Approximately half of the costs are attributable to extra work required to install the steel reinforcing. Rewiring the building has cost approx. $40,000, new stacker doors $15,000, and plaster repairs $16,000. In the last few days we have been faced with extra costs of replacement damaged ceiling tiles $4,000, extra connection to street storm water $5,000, seismic bracing to be installed for heaters $5,000. These are not luxury add ons, but essential work that will have to be done to get a Certificate of Compliance. We believe we have approx. $300,000 left to complete payment for the repair work on the building. Funds currently available amount to $155,000, but we also have a GST return due in January of approx. $90,000. That still leaves a shortfall of approx $55,000. There will be a further GST refund due in July 2019 which may total $40,000+ but obviously we will have accounts to be paid before then. We are still working to clarify this situation, but feel you all need to be informed of the situation we are facing. We will erect a fence between the church and the old manse…. The insulation in the manse roof will need to be topped up before July 2019. 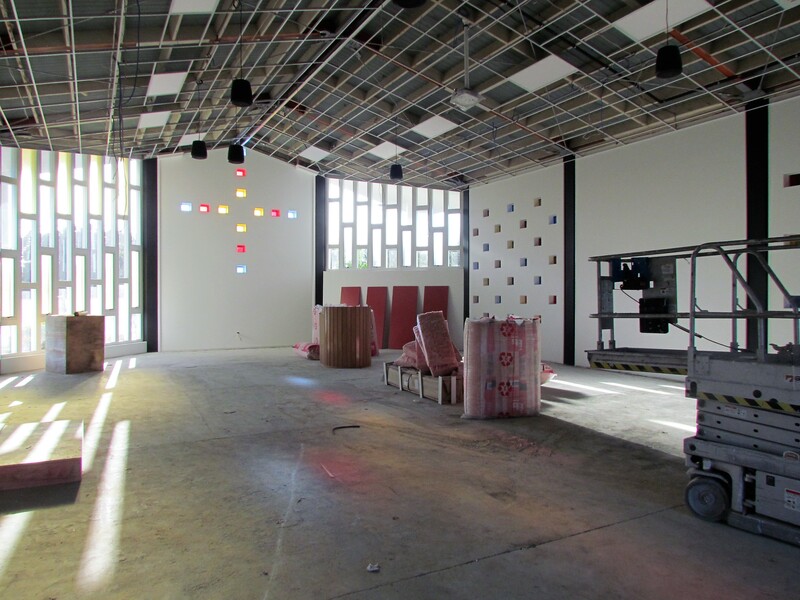 Work completed this week at the church…. 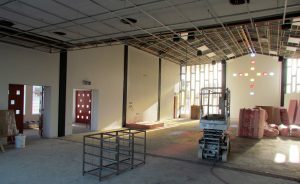 Ceiling insulation has been placed and installation of ceiling tiles begun. The heaters have to be seismically restrained. Vinyl is laid in the kitchen and bathroom. Sanding of the floor in the church and lounge is complete. Carpet tiles will be laid this week. We think the sliding doors can be raised by 10mm which will mean they are easy to slide. The final plumbing fit out will occur this week. Post Christmas there will be a small amount of work to be completed in the upstairs store and the chip sealing of the car park will be completed. With the Christmas shut down of 3 weeks it will be the end of January before Simon’s complete their work. Practical completion will therefore be early February and then we will wait for a Code of Compliance Certificate. We expect to be able to use the building sometime in March 2019. New clear glass has been added to the front windows. 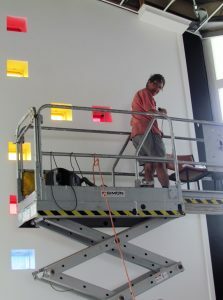 Warren installing small lights into the feature cross windows. What is your Deep Yearning? Yearning is not a word often used these days. It’s probably a word like trivial… Anyone under 20 would have no idea what it means. I looked up a few dictionaries and a common definition would be an intense longing or eagerness for something. Often they tell us that longing isn’t easily met. Yearning isn’t a word we use often and yet I think it’s a deeply religious word. I think God is usually found in our yearning. True yearning comes from deep within, from our soul. If you are in touch with your yearning you’ll be in touch with why God breathed life into you. I need to offer a word of caution. Wanting or wishing are not yearnings. I might want a nice new car, or I might wish for a new knee for Christmas that doesn’t give me pain, but yearnings are something much deeper. We all have a host of things we might like or want in our lives but that’s just the outer shell of the onion. Yearning comes from deeper inside. I often ask a question when I offer spiritual direction to people and that question is what do you deeply desire of God right now. That’s not a question that people answer easily and you can usually feel the a palpable deepening of mood as someone starts going deeper within themselves. Yearning is deep stuff, and after some stillness an answer might come back, “to know I’m valued”, or “help and encouragement to live out my inner calling” and if we go deeper it might change “help and encouragement for everyone to have opportunity to live out their inner calling.” I wonder what you may deeply yearn for? It’s a question we don’t ask often enough. If we look at the story of the Hebrew people in the Old Testament you’ll discover a deep yearning that revolves around justice and security. The people yearn for a peaceful existence where there is harmony and life for all. I think there is also an even deeper yearning that doesn’t surface as often but that is about truly being a light for the nations, and modelling the true life of God. Unlike us they were a deeply communal people who were far less individualistically focused. The yearning is for their own land where they can settle and raise their families. Abraham typifies this yearning as he journeys from modern day Iraq to end up in the region we now know as Israel. But he and his family are just one of the inhabitants of the land and things don’t work out well. Abraham and Sarah’s descendants end up as slaves in Egypt. They cry out to God with a deep yearning for freedom and God hears them and leads them out of Egypt to fulfil their deep yearning to settle in their land, the Promised Land where the ideal was they would live as God’s chosen people showing the world what godly life was all about. They finally cross the Jordan and Joshua the mighty leader sets out to subdue the occupants of the land they yearn for. There is success and roots are put down, but things go terribly wrong when they move from a tribal culture to a nationalistic culture ruled by a king. With few exceptions the kings of Judah and Israel do what is evil in the sight of the Lord. Key in that evil mix is a feathering of their own nest and a failure to act justly in their rule to ensure all the citizens have a fair slice of the cake and opportunity to participate in the working of society. There is no true peace and the proud societies of Israel and Judah are crushed by foreign powers and the story of Exile plays out. The people yearn for a homecoming and a new relationship with God and each other. We hear of this yearning in the proclamations of the prophets of the Old Testament. There is a yearning for a different sort of king and a different kind of kingdom. There is a yearning for new leader, a promised one, who would “do justice”, “love kindness”, and “walk humbly with God”. Sometimes they expressed this great yearning in a hope for a new David, a son of David, a new shoot from the stump of David. David they remembered fondly as being a just and godly king who ruled Israel before the monarchy became opulent and exploitative. We sang about this hope in the song we just sang that is based on the words of Isaiah – come let us go up to mountain of the Lord (to Jerusalem) that we may learn of God’s ways and paths. God will rule again and people will beat their swords into ploughshares and their spears into pruning hooks and nations will study war no more. It’s an image that has fed humanity for thousands of years. Death to the arms trade, peace and harmony for all the earth. Micah (Micah 4:1-4) has similar words but he adds “and they will sit under their own vines and under their own fig trees, and no-one shall make them afraid”. It’s a wonderful image of every family having their own land and therefore a secure and bountiful now and a secure and bountiful future. Everyone has opportunity … not just some. This is the world the prophets yearned for. This is the world the prophets stirred up a longing for. The Hebrews returned from Exile to rebuild their shattered society but by the time of Jesus the Hebrews had lived under one empire after another for 500 years. There were times when things weren’t too bad for some, but overall it had been grim. In Jesus’ time over 90% of the population lived in abject poverty, scratching out an existence with no surety that their family wouldn’t go hungry. We know at the time of Jesus’ birth there were major uprisings and the Romans sent in crack troops to Galilee to take care of the Jewish rebels. Sepphoris the local big town for the people of Nazareth and possible birthplace of Mary was ransacked about the time Jesus was a youngster. Women were raped, men were slaughtered, homes burned – when the Romans sent in the troops it wasn’t pretty. I wonder how many in Jesus’ close family were killed or abused. Heavy taxes were a fact of life, imposed to fund the troops and to fund the fine palaces of the emperor and his representatives. There was a deep and yearning for something better and a deep yearning for a new leader, a Messiah to establish a new homeland where peace and harmony might flourish under the reign of God. He has scattered the proud with the thoughts of their hearts. There is a new wind blowing. A deep yearning of the people is heard. There is a coming together of God and people in a new way and when that happens there will be change. John the Baptist spoke as a voice in the wilderness of the need to see with new eyes and to repent. (Luke 3: 1-14) The person who has two shirts must share with those who have none, honesty and respect had to be at the core of our living, greed and wanting more for self had to give way to seeing a bigger picture and balancing our needs with the needs of others. Those with responsibility must use that responsibility for the common good. The yearning was for a new society, a more equitable society, a compassionate society and John like the prophets of old was stoking the fires of yearning. The yearning of God and the yearning of the people were in harmony and when that happens there is a radical power released…. And we know what happened. A saviour was born, a new light was ignited, a radical new movement took root that changed the world forever – all based on a simple catch cry love God and love your neighbour as you love yourself. So as we prepare for Christmas, a question; what is it you yearn for? What do you deeply desire? What is the ache at the very core of your being? Beware though, if you really start digging, if you go deep it will bring your life into focus, and it will bring you close to God. It could be scary and it certainly will be risky and challenging. It will also be fulfilling. What is your deep yearning? I invite you to consider your yearning this week as we continue our journey of giving birth to Jesus in our beings this Christmas. One final word….our yearning is often not clearly defined. It’s not usually reduced to a simple statement, but the best we manage is often to say’ “it has something to do with…..” “Something to do with”, is a good place to start. Posted in Sermons	| Comments Off on What is your Deep Yearning?